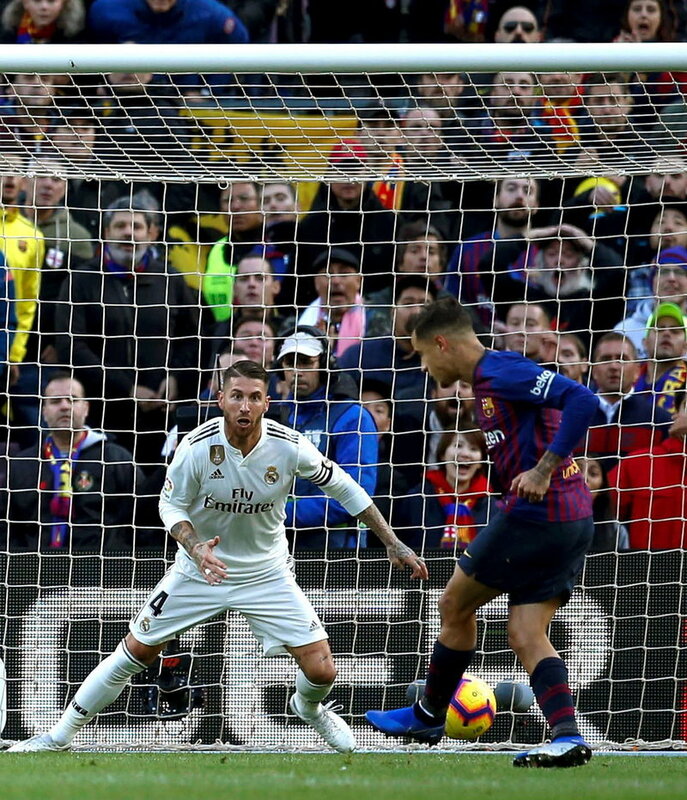 In his regular look at the fortunes of our local teams in the top flight of Spanish football, host of El Punt Avui TV’s The Week in Football Barney Griffiths turns his attention to last season’s double winners Barça. Barça on top but not yet at full throttle Arxiu. Coutinho opens the scoring against Real Madrid. Messi injured. EFE EFE. So as December rolls round we take our first look at Barça this season. The last time we left them they were en route to a league and cup double, the only disappointment of Valverde’s first season in charge being that infamous 3-0 defeat in Rome that sent them crashing out of the Champions League after taking a seemingly insurmountable 4-1 lead to the Italian capital in April’s quarter finals. A swift glance at the table at the end of November tells us that the Blaugrana again sit on top of the table with 24 points from 12 games, one point ahead of Sevilla, led by Pablo Machín (who of course brought Girona promotion), Atlético Madrid and the surprise package so far, Abelardo’s Alavés. Another surprise is of course the complete turmoil surrounding sixth-placed Real Madrid and what they would perceive as a disastrous start to the season, with four defeats among their opening 12 games, and the subsequent dismissal of Julen Lopetegui, who went from future managerial star at the helm of the potential world cup winners to unemployed in the space of four short months. Such are the pitfalls of modern football management. But back to Barça, who have also unusually suffered two league defeats already, and therefore one more than in the whole of last season. The first was a 2-1 reverse at last-placed Leganés, which was riddled with defensive errors and raised question marks over how many changes Valverde can make to the starting line-up for his side to still retain its superiority on the pitch. The other defeat comprised a 4-3 loss to a Betis side that had the temerity to outplay the champions at the Camp Nou. No mean feat that, and testament to head coach Quique Setién’s strong belief in his own footballing philosophy. One interesting aspect of Barça’s season so far has been the “Messi dependence” theory being put to the test as the mercurial Argentine magician was out for five games with a fractured arm. During that time, Barça went unbeaten, defeating Inter (2-0) and Real Madrid (5-1) and winning at Leonesa (1-0) in the Cup and at Rayo in the league (3-2), before gaining a creditable and important draw at Inter (1-1) in the Champions League. 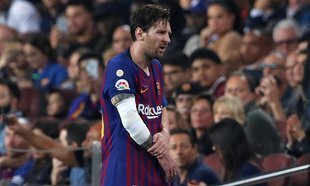 When he did finally return against Betis at the Camp Nou, Barça suffered their first defeat in nine matches, making a mockery of the theory that the Blaugrana need him in the team if they are to win their games. One man who does appear to be a huge loss when he’s not around, and as mentioned in this column last year is turning into one of Europe’s top performers, is centre back Samuel Umtiti. The French international has only played six league games and one CL game this season after suffering a knee injury in the defeat at Leganés. Although the results since have not suggested he has been missed, Barça’s defence, and Gerard Piqué’s performances, certainly seem t be more assured when he is in the side. Thankfully for Barça fans, he is scheduled to have made his return by the time this article goes to press. Coming up are a vital trip to the Wanda to play Atlético, who will surely be title contenders again, and in December the first derby of the season against an Espanyol side that has hit the ground running under Rubi. In this year’s Champions League, Barça were drawn with Tottenham, Inter and PSV. After four games they top the group with three comfortable wins and a 1-1 draw in Milan. The two remaining games are away at PSV, who they thrashed 4-0 at the Camp Nou in the first group game, and at home to Tottenham, who they saw off equally impressively with a 4-2 win at Wembley. That performance in London may have been the best Barça display of the season so far, with the English press later saying it could have been seven or eight, such comfortable winners were Valverde’s men on the night. Passage into next year’s knockout stages is pretty much assured then, and topping the group also more than likely, so job all but done in this year’s competition as Barça look to atone for last year’s calamitous exit in Rome.